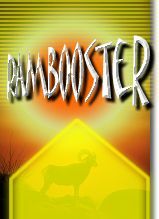 just to show you it is possible to free almost all the RAM using RamBooster. Remember that when the screenshot was taken I had PaintShopPro running to capture the screenshot. We all know that PSP eats a lot of memory.... Well, this shouldn't be taken too seriously, this is only to show it REALLY works, but this shouldn't really ever be done. To show that my computer has very good uptimes using RamBooster. Uptime is 42 days 15 hours 7 minutes - and still going! was ever up was about 1 day!